Crystal Clear Pickups mid '60 reproduction P Bass pickups. Slightly over wound in comparison to our 70's set. Hand wound with 42 plain enamel wire. Alnico 5 magnets with flat poles. 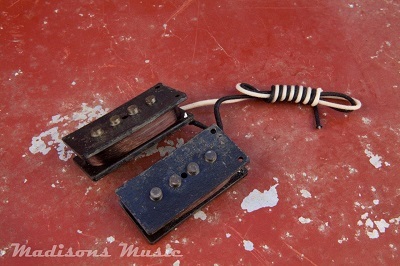 Our 60's P Bass pickups offer the classic brilliant tone you would expect out of an early P Bass. The response and attack is almost identical. Nice noticeable mid range and clear overtones. Uncompressed crunch when pushed. Our aged pickups can be aged to any level of distress. Our hands on experience with vintage instruments gives us the upper hand to reproduce authentic vintage tone.